The Fellowship was fortunate enough to obtain a copy of LEGENDS OF THE NIGHT: IN THE SHADOWS OF ROME from Headless Horseman Productions. The story is written by Karl White, with art, colors, and lettering by Felle Jones, and covers and layout by Maryann White. The LEGENDS OF THE NIGHT series was created by Karl White. The Roman Empire is crumbling due to its greed and overindulgence. Alaric I threatens to destroy the city after not receiving his compensation for his allegiance. Emissary Nonus secretly meets with Alaric and proposes a deal: the surrender of the Roman noblemen in exchange for the safety of the citizens. Alaric agrees but warns Nonus the dangers of any kind of resistance. Nonus goes back to the Senate and tries to persuade them to negotiate. A mysterious woman appears and tells them that the city is surrounded by Alaric’s forces and they should follow her to safety. She is then forced to show her true nature…she is a vampire. But can she be trusted? And what are Nonus’ true motives? The story is short and everything is resolved so quickly, which is unfortunate. However, I do like the idea of vampire-like creatures in Roman times. Overall, this is a nice little tale. The art is alright, but it was the coloring that really impressed me. This is the fourth book in a line of comics called LEGENDS OF THE NIGHT which you might want to check out. 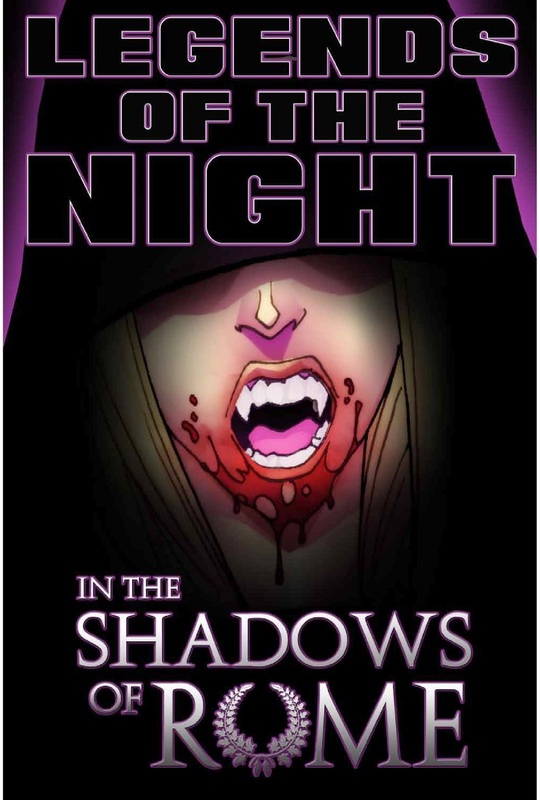 LEGENDS OF THE NIGHT: IN THE SHADOWS OF ROME is available at www.legendsofthenight.com.